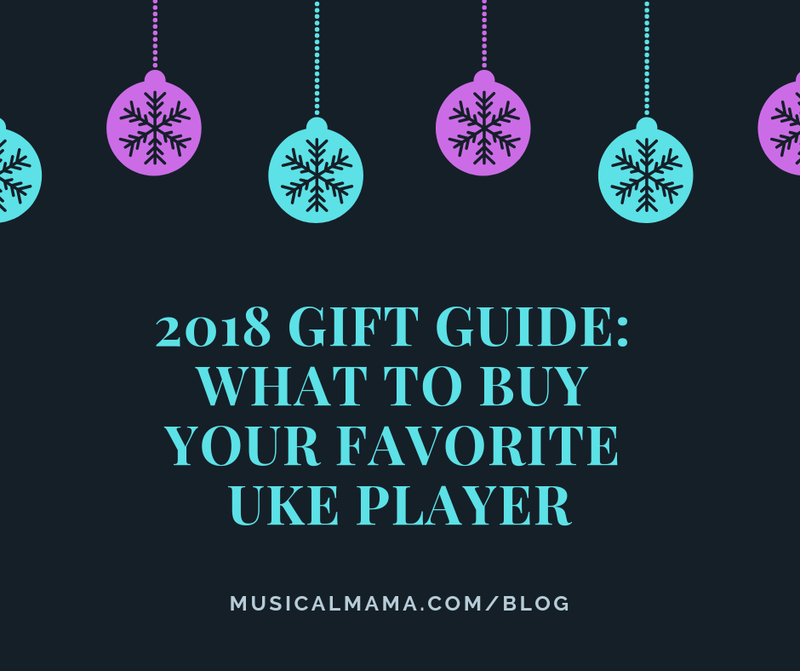 Wondering what to get for your favorite ukulele players? Choose something that supports their love of music! Here’s a roundup of some practical and thoughtful gifts that do just that. All of these items are available from Amazon Prime (at the time I’m publishing this) for $25 or less! A digital clip-on tuner is the fastest, most accurate way to tune an ukulele, and every uke player needs at least one! I have several myself, but I might start playing favorites if I had one as adorable as this! If the owl is too cutesy for your uke player’s tastes, perhaps this glow-in-the-dark rock-and-roll tuner makes more sense? I think it would be perfect for gigs or just jamming with buddies. And btw, these tuners work for most other string instruments, not just ukes! Picks are a nice option for guitarists who are used to using picks and for beginners who have difficulty strumming with their fingers and/or thumb. These felt picks come in a variety of color combos and are gentle on ukulele strings. I saw so many playful and well-reviewed ukulele cases available on Amazon Prime! A colorful case like this would be such a fun conversation piece at the next uke group meetup! I encourage my students to take their ukuleles out of their cases as soon as they get home, because it makes you so much more likely to pick it up and play. An attractive wood stand such as this one turns any bookshelf or table into a uke display center. Stands are perfect for anyone, but especially nice for renters or chronic furniture rearrangers (like me) who can’t commit to the wall-mount hooks! A strap can make a big difference in one’s playing. This option requires no drilling and it fits all ukulele sizes and shapes, including soprano, concert, tenor, baritone, pineapple, and even the UBass. It’s common for uke players to bend over their instruments to get a better look at the song they’re playing. Setting the songbook (or iPad) on a proper music stand ensures better posture, which dramatically impacts one’s overall playing (and singing, too). Music plays a joyful role in the Christmas season, and it’s a wonderful time of year to sing, strum, and make merry with friends and family. My new holiday songbook includes an Ukulele Chord Chart for Easy Transposing, tips for singing, strum patterns for playing in 4/4 and 3/4 time signatures, and the chords and lyrics for thirteen classic Christmas songs. Available in paperback for $10, and as a digital download for $8. Order by Saturday, 12/15/18 to ensure delivery before Christmas! Here's a collection of instruments that range from happy little stocking stuffers to big gifts that create a real "wow" factor for your kids on Christmas morning. My selections may skew toward the noisy side, but there's nothing quite as joyful as a preschooler feeling empowered buy the big sounds they can make! You can find packs of cheap kazoos at any party store, though I find this whimsical set to be particularly irresistible! This pair of Hohner maracas is sized just right for the preschooler's grip. It's shiny, it makes a big sound, and it comes with its own case. I think that checks all of the boxes! Just make sure to buy one in a key that makes sense for you. If you or a family member play the ukulele or piano, you may want to buy a harmonica in the key of C. If you play the guitar or other string instruments, you may prefer a harmonica that is set in the key of G.
This toy is SO. COOL. Your child is the conductor of this orchestra and can mix and match the musical arrangements for fifteen different songs. I love that this toy exposes kids to such a variety of instruments and encourages them to be more active listeners. Anecdote: after having the toy for a while my then-two year old son and I were listening to music and he was having fun identifying all the different instruments he heard, saying, "Mama, that violin is so pretty!" You can find Symphony in B on Amazon and on eBay. You might be able to find the new version of the toy in-store at Target, but it's no longer listed on their website. This last item is not for the faint of heart! Square footage is at a premium here in the Bay Area, so I understand not everyone has the space for one of these babies. But if you do, I highly recommend one of these babies. 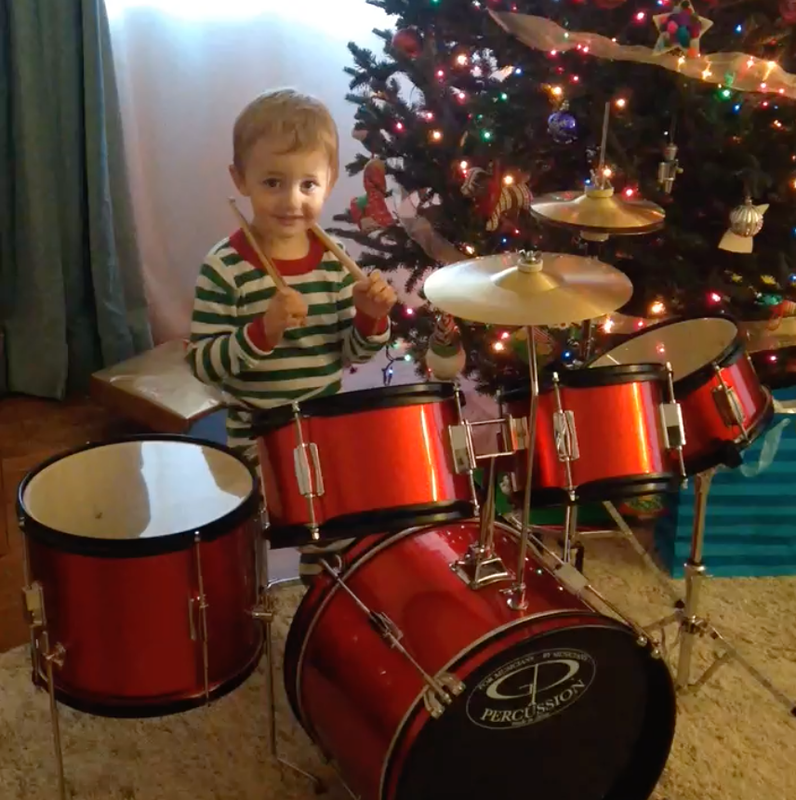 Rhythm and tempo are the foundation for music, and drums are a terrific first "real" instrument for kiddos. Plus, it looks stunning under the tree and is such a hit when friends come over for playdates! Just make sure to include a pair of noise-reduction earphones and kid-sized drumsticks! Three-piece drum sets are another option, but I'm partial to the five-piece sets that include high hats. The kids and I had fun learning how to play by watching thislisa's drum lesson tutorials on Youtube. Baby's first instrument! These Nino egg shakers can be grasped by even the tiniest of hands and are so satisfying to shake that even big kids and adults enjoy playing with them. In fact, we bring them on our road trips so we can jam in the car! 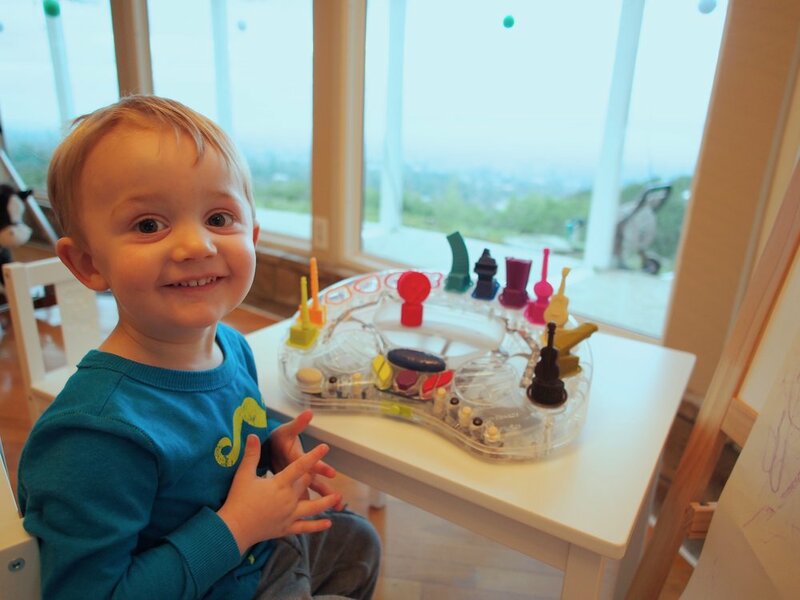 This cute set of rattles includes a mini rainbow shaker, a maraca, a rattle, and a cage bell. Hohner's Baby Band is well constructed and is listed as safe for ages 3 months and up. So many parents are drum-averse, as if not having them will somehow make their children less noisy. I say, it's better to have them banging on a drum than on their siblings, or any of the other things I don't want them thrashing! These bongos from Remo are a fun option that also work for preschoolers and older kids. In my experience, kids don't get quieter with age, so if your kids make too much noise, drums or no drums, a pair of these may save your sanity— try a pair for each noise-maker in your house, plus a pair for you (they say they're kid-sized but they fit my adult-sized head just fine). Remember banging on old Tupperware containers and pots and pans as a kid? Those still work! 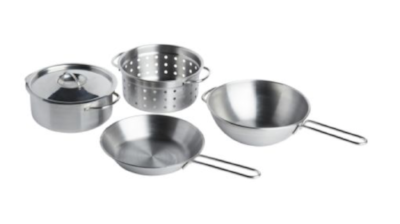 This cute play set of pots and pans from IKEA works in a play kitchen or in the family band. Pair it with a wooden spoon or wooden mallets plus any plastic food storage containers, bowls, lids, pots, or pans you may have floating around the kitchen. And if you don't want to share your real stuff with your little one, a quick trip to the thrift store is all it takes to supply your toddler with an entire kitchen-themed orchestra! An update of my original post from 11/29/2016. My tuner recommendation remains the same, but I have updated the ukulele section. So you've signed up for lessons? Yay! This is so exciting! Now let's make sure you have what you need to get started. There are really only two things you'll have to bring to the first lesson: a digital tuner and a ukulele. This post includes my recommendations for obtaining those items with only a modest initial investment. If you have kid-friendly instruments around the house, it's easy to turn your ukulele practice into a family jam session! All of the instruments I'm recommending come from years of being tested in my own home. They've held up to years of use (and abuse) and still sound great! When you think of rhythm instruments, you might think of drums. But really, there's an array of instruments that fit this category that can add dynamic sound to your family jams at home. Rhythm instruments are great because there's no learning curve. Odds are, your kid already knows how to bang on things, so all of these options work for babies, toddlers, big kids, and even adults! Tambourines are an easy way to add a friend in to the mix. I recommend buying a "real" one versus a kids' version. The sound will be much fuller and that alone will make it more fun to play. And if it's too big for your child's hand, don't let that stop them from playing! Set it on the floor and have them bang on it as if it was a drum! Babies get pretty thrilled when they discover that they can make music on their own! These shakers are a great size for tiny hands, and they make a surprisingly nice sound. Babies love to mouth them, but there's no danger of choking with these perfect-sized shakers. We frequently bring these on road trips so we can rock out to the radio on long drives. These jingle bells are perfect for when you're singing holiday songs at home. They can be worn as bracelets or simply held in the hand to add a fun rhythmic element to your singalong at home. Babies and toddlers have a great time banging on this durable drum, and it's a little easier to stomach one (relatively small) floor drum than a full drum kit! It includes two soft-head mallets for playing, but it's just as fun to tap out rhythms with your hands. These individual xylophone keys are fun to play all at once, sure, especially if you like to tap out melodies. But if you want your child to sound in tune with your ukulele, give them just the 1 and 5 tones for whatever key you're playing in (what I'm saying makes sense if you've gone through my beginner’s ukulele course!). For instance, if you're playing in the key of C, have them bang on the C and G bells; if you're playing in the key of G, give them the G and D notes to play. Baby-proofing note: the black tips of the little mallets have repeatedly fallen off of our sticks, so please be careful if you have a child who likes to mouth objects. I recommend you kickoff your ukulele adventure with an affordable instrument. In large part, this is because I want you to have an ukulele you can hand down to your children when you're ready to upgrade. You are their role model, and it's natural for them to want to play the same instrument you're playing. A set like the Melissa and Doug Band in the Box is a fine shortcut to building your at-home instrument collection, and if you already have one, great! Play with what you have! But in general, I recommend buying instruments individually so that you'll have more control over your instruments as well as higher quality materials and better quality sound. So you've signed up for lessons? Yay! This is so exciting! Now let's make sure you have what you need. There are really only two things you'll have to bring to the first lesson: a digital tuner and a ukulele. Here are my recommendations for obtaining those items with only a modest initial investment. A good digital tuner is as important as your instrument. It won't matter how great your playing is if you're out of tune! My current favorite is the Snark SN5X. You can find it on Amazon Prime for about $10, and it has a big bright interface that makes it easy to tune up your uke. There are other methods for tuning instruments, like phone apps and pitch pipes, but I find the digital tuner to be the easiest, the fastest, and the most accurate way to tune up an instrument. Great! Make sure it's a soprano, concert, or tenor ukulele. Sopranos are also called "standard" ukuleles, and it's the small, friendly size you typically picture when you think of a ukulele. Concert and tenor ukuleles are bigger and have a slightly different sound, but sopranos, concerts, and tenors all have the same GCEA tuning, which is what we use for the course. The only ukulele that won't work for the Foundations course is the baritone ukulele, which has a different tuning. If you were just learning how to drive, you wouldn't learn on a Ferrari, would you? And it wouldn't make much sense to go car shopping if you didn't know how to drive, would it? How would you even know what to look for, or what features were important to you? If you buy an expensive ukulele, I think you're more likely to look at the instrument as a burden than a source of joy. You may feel guilty for not already knowing how to play it, or feel a responsibility to practice instead of viewing it as a source of fun. You won't feel that pressure if your start-up costs are low. Learn to play first. Then you can make an educated decision on what kind of ukulele you'd like to buy. And most importantly, once you've upgraded, please pass your starter uke on to your child, so s/he can play with you! Updated 3/2/17: I've received multiple requests for a recommendation that's a step above the candy colored Diamond Head and Mahalo ukuleles. If you'd prefer to invest a bit more in your instrument, Kala is a brand that makes several ukuleles with good tone and good construction in the $50-150 range. Happy strumming!